Spring cleaning isn’t just decluttering your closet and throwing out old papers. 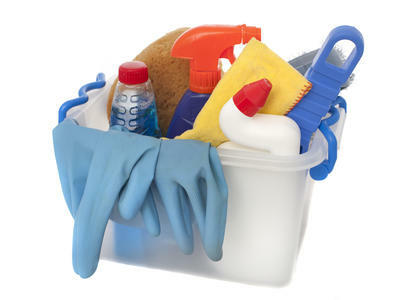 It’s a time to clean parts of your home you might not think of throughout the year. It’s also a good time to reflect on your home safety and make sure you’re prepared for emergencies. If you’re a homeowner, a little extra effort can help you protect and maintain your investment. Change smoke alarm and carbon monoxide detector batteries every 6 months. Plug all electronics into surge protectors to prepare for lightning storms. Update your first aid kit. Prepare an emergency kit with flashlights, food, and water. Clean range hood filters monthly. Use a degreaser mixed with hot water. Dust ceiling fan blades every week or two as needed. Wipe fan blades in the kitchen with degreaser after cooking greasy meals on the stove. This prevents the grease from hardening. Clean refrigerator coils. As the coils get dirtier, your refrigerator requires more energy. You can save up to $100 a year by doing this. Check and replace air condtioning filters at least every three months. This keeps dust from gathering around teh machine and lengthens the life of the unit.